While it tends to be the Tarot card most people fear, Death (XIII) — the thirteenth card of the Major Arcana — doesn’t have to imply physical death. Rather, it more often portends spiritual transformation or new beginnings. Undoubtedly the most misunderstood of the entire deck, this card depicts a skeleton on top of a horse, wearing armor and holding a flag. As the dead and infirm lay on the ground before him, a man clothed in religious garb appeals to him for salvation. 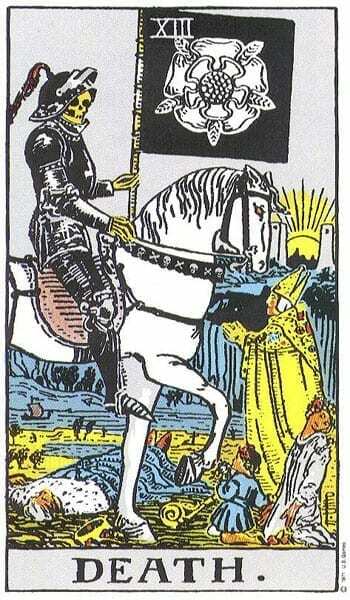 Death is shown riding a magnificent white horse, holding up a black flag with a white pattern. He is portrayed as a living skeleton, his bones the only part of his physical body that have remained intact. His armor represents his invincibility, the fact that no living thing can ever hope to avoid or destroy Death, while the white horse he rides signifies purity, as ultimately Death purifies everyone. Among those on the ground in front of him are both a pauper and a king, demonstrating that Death doesn’t distinguish between social classes: the rich and the poor, the strong and the weak — ultimately every living thing must submit to him. Yet in spite of the dark imagery, Death also signifies change, letting go of the past in order to move on to a better future. Death denotes someone who is going through a major transformation, often after experiencing significant loss — in other words, someone who carries a great sadness inside, regardless of their talent at masking their grief. In this context Death represents a person who must learn to let go of that which they cannot control. At worst this person is attracted to the dark and macabre and enjoys feeling a sense of danger, sometimes seeking it out against their better interests. Likewise they can be controlling and manipulative, particularly with respect to money, and may find themselves in debt on a regular basis. A person represented by Death may be vindictive, forever dreaming of taking revenge on those whom they believe have betrayed them. In an upright position the Death card signifies that one cycle of life is ending and a new one is beginning. However, to realize your future you first must learn to leave the past behind. Once this has been accomplished, much like a phoenix rising from the ashes, you will experience rebirth. There are few positives about drawing Death in a love reading. At best, it’s saying that your next relationship will be radically different than any you’ve experienced in the past. In order to see this potentially great romance realized you’ll first need to lose your baggage and transform your habits, attitude, and patterns to allow someone new into your life. In a career context drawing the Death card serves a warning not to get too dependent or complacent at work. If there’s one constant in life it’s that the center never holds, things are forever changing, and you could find yourself forced to find new employment. If you’ve been contemplating a new job or launching a new business but have been reluctant because of the presumed security of your current employment, Death is telling you that it’s time to jump ship — the change will be positive. Your access to money could be tightening soon and you’ll need to make a few sacrifices to deal with the coming financial challenge. Don’t fret too much when this happens — face the situation head on and do what you must in order to survive these challenges. Ultimately, you will profit from everything this period of life teaches you. Do everything possible to keep your stress levels manageable over what could prove to be a difficult phase of life. Don’t resort to drink or drugs in the effort to cope with these challenges. Instead look within, and focus your energy on the spiritual plane. Exercise daily, meditate, try yoga — just don’t abuse your physical and mental health through substances that could eventually lead to your downfall. In reverse Death remains focused on the change you so desperately need, but indicates that you keep resisting it. Don’t be afraid of the unknown. Trust that you’re taking the right steps and don’t waste time looking back. This is not the card you want to be faced with in a love reading. It can mean your partner will meet their demise long before you do or that the death of a loved one is imminent. Death is considered to be the card of final endings, so if you are concerned about the state of your relationship, this definitely isn’t a good sign. The Death card reversed portends that it’s time for a career change or new direction in your professional life. You may be bored and sick of your job but keep doing it day in and day out because you like the sense of security that comes with a steady paycheck. Which is fine — except you remain unfulfilled. Start giving some thought to finding more meaningful work. When Death appears reversed in a Tarot spread it’s an omen that a financial crisis is imminent and you’ll need to rethink how you manage your resources in order to survive it. This is a good time to reevaluate your relationship to money. More so than ever, you need to let go of your bad spending habits and be more responsible with your money. In a health context Death reversed is definitely not a good sign. At best the card is telling you to stop ignoring your aches and pains and finally see a doctor about them. They could be the physical manifestation of an unresolved emotional problem that you’ve been trying to ignore, hoping it will heal on its own. Unfortunately, it won’t. Deal with your issues and enjoy the relief and renewed positive energy that being proactive about it brings you. Death in the past position indicates you have moved into a new phase of life, that you are at the end of one cycle and arrived at a time of new beginnings. In the present position, it means that something big is literally in the cards for you and it will arrive with little to no advance warning. This is likely to be a positive change, although you may lose something that’s been important to you in the process. Death in the future position is a sign that you need to find a new perspective on the world in order to move forward. Put the past behind you, your journey is just beginning. Death represents the last step before the start of new beginnings, a rebirth of sorts, and instills this meaning in card combinations. Death combined with the Chariot card denotes that it is time to roost or to put down some roots and enjoy the process of becoming settled. The Five of Wands paired with the Death card indicates that where there has been a conflict in your life, there will now be peace. Resolution is at hand. 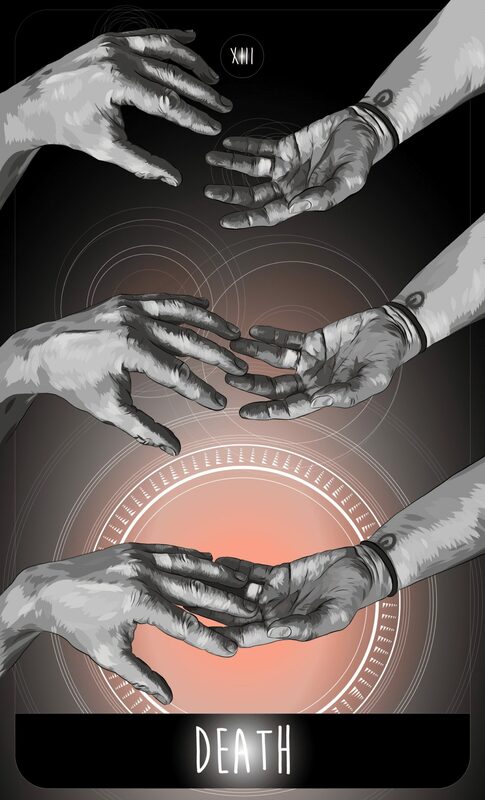 This indicates that you’ve cheated death on at least one occasion, and further emphasizes the Wheel of Fortune’s meaning: you are at the mercy of fate, yet you have emerged stronger from these harrowing experiences. Death reversed and the Hanged Man indicate that you’ve lost hope and are giving up. This combo can help you achieve peace of mind as it suggests that you will see an end to any financial troubles you may have been experiencing. Wait to celebrate but have confidence in what this card combination reveals.